Respected American business historian Ralph Willard Hidy was a friend and supporter of the Forest History Society (FHS) for twenty years. A former president of the FHS Board of Directors and longtime member of the Society, Ralph Hidy helped the Forest History Society pursue rigorous historical scholarship in the fields of forest and conservation history. In recognition of his significant scholarship and service to the forest history community and to the Forest History Society, the FHS Board elected him a Fellow of the Society in 1972. The Society's award for best article published in the Society's journal is named for him. The Leopold-Hidy Award is awarded annually based on the recommendations of the journal's editorial board. Ralph Willard Hidy was born in Portland, Indiana, on 21 April 1905. He received an A.B. in history from Miami University in 1926, an M.A. from Clark University in 1928, and a Ph.D. from Harvard University in 1935. 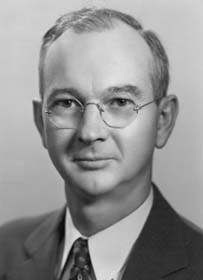 Throughout his long career as a historian, Hidy worked at such respected institutions as Norwich University (1928-1930), Wheaton College (1932-1947), New York University (1950-1957), and Harvard University (1957-1971). His primary field of study was business history. Hidy was a member of numerous professional historical associations, including the Economic History Association, the American Historical Association, the Organization of American Historians, and the Forest History Society. At various times he held officer positions on the boards of such organizations. He authored many books and journal articles pertaining to American business history and served as an editor for Harvard Studies in Business History (1962-1971) and Business History Review (1962-1965). Hidy resided in Belmont, Massachusetts, at the time of his death on December 5th, 1977. Ralph Hidy supported the Forest History Society in various capacities for many years. He was a director on the FHS Board from 1957 to 1972 (president of the Board 1965-1967) and was a corporate member of the Society from 1972 to 1977. Hidy also regularly served as an award judge and book reviewer for the Society. In recognition of his significant scholarship and service to the forest history community and to the Forest History Society, the FHS Board elected him a Fellow of the Society in 1972. The Society honored him posthumously by renaming its award for best article written in the Society's journal the "Ralph W. Hidy Award" (now the Leopold-Hidy Award). "Hidy, Ralph Willard." Directory of American Scholars. Sixth ed. Volume 1: History. New York: R. R. Bowker Co., 1974, p. 279. "Hidy, Ralph Willard." Who Was Who in America. Volume 7, 1977-1981. Chicago, Ill.: Marquis Who's Who, 1981. "News, Comment & Letters: [In Memoriam Notice re Ralph W. Hidy]." Journal of Forest History 22:2 (April 1978): 112.